Good morning and welcome to the Fall in Love with Texas Blog Hop! We are happy to have you visit us here in our great state. Each year since Poofing the Pillows began I've had greatest intentions of being that girl. The one who has it all together way ahead of time. She has the perfect art and the perfect cake to go with it. She has a pretty picture of herself chopping veggies or hanging a wreath of succulents with the perfect bow. I want to be that girl I really do! But the truth is I'm not that girl...are you? Maybe you aren't either and if you not well I say, "Thank goodness!" The pressure's off here. OK? 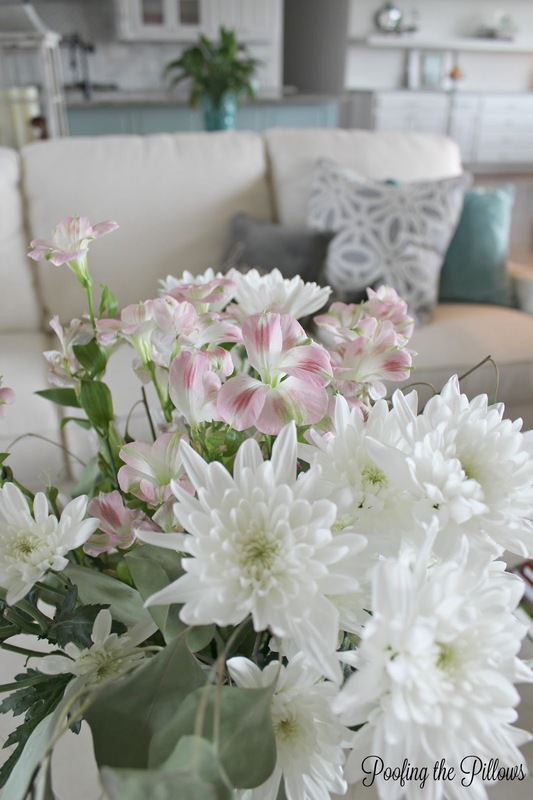 Here's what I've done to in a very real world way to make our Texas home feel fallish and cozy all while the air conditioner runs its little heart out. Let's start in the kitchen. I dusted the open shelves and added coffee beans to an apothecary jar. I don't think apothecary jars are the in thing anymore but I still love them for the shapes and endless possibilities. The coffee beans add a deep rustic color that is lacking in our bright white kitchen. The cotton stems were in a paper sack in a closet but I dug until they were unearthed. I've been lighting a wonderful cinnamon pumpkin scented candle in the kitchen. If I close my eyes and imagine just a little, the scent can take me from a hot day near Dallas to somewhere on the east coast with leaves falling gently and a cool breeze blowing. That's what I'm thinking anyway. The mercury glass pumpkin has been around for a few years and I'm always happy to bring it out again. There's a Hobby Lobby chalkboard on one wall with my very own handwriting. One of these days I will learn calligraphy but it hasn't happened yet. It's on my list. Over in another corner we have the antique scale that I bought just about this time last year when hubby and I went to an antique market. We wheeled and dealed for this scale and then carried the heavy thing back to the car smiling. Antiques and fall just seem to go together. Don't they? 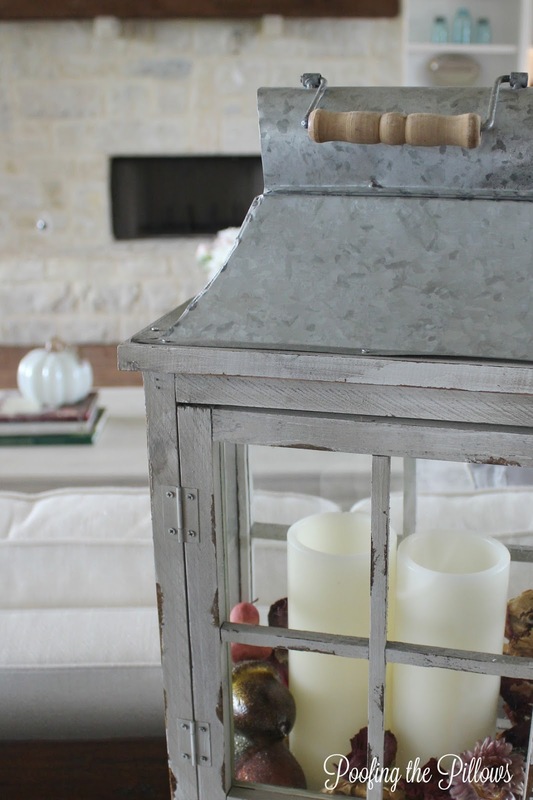 Over in the family room I added potpourri and faux acorns to the lantern that is always there. I felt pretty accomplished by this designer move. I poofed the pillows that little Belle had been sleeping on and freshened up my grocery store flowers. This year I discovered I'm the last person on the planet to know about fresh eucalyptus and let me tell you - it's amazing in an arrangement, lasts forever, and smells wonderful. 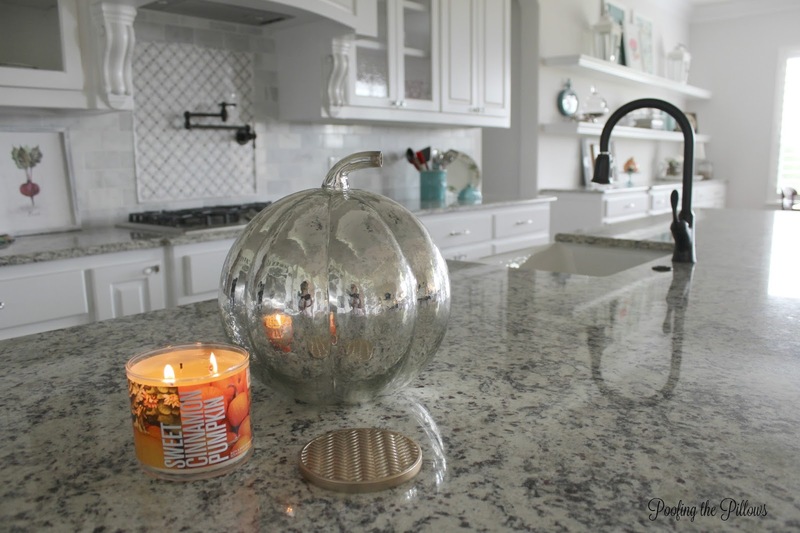 I grabbed this little glass pumpkin at TJ Maxx a couple of weeks ago and I love it! A collection was born at that moment because I plan to get more as I find them. That's about it for me. A few pumpkins, a message on the chalkboard, some pillows, and a candle are all it has taken to give me that fall feeling! I don't have any cake to offer you but I have lots of coffee if you'd like some. Just one average girl to another, I'm really glad you stopped by today. I hope you'll pop on over and visit my other Texas friends. They are far above average and sweet as can be!! So many great takeaways from this wonderful and creative post Stacey. 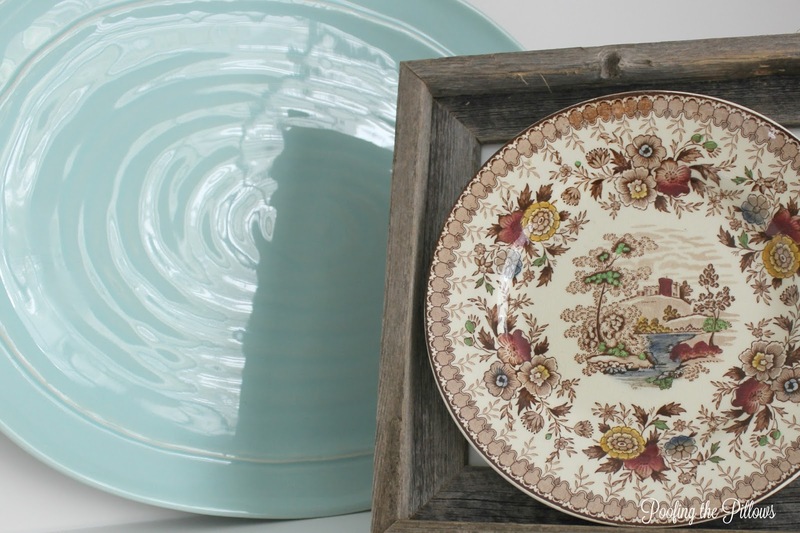 I love the plate in the box! Well, I think it is all adorable. I am definitely never ever together, so I am with you! I love being an average girl, too, Stacey, but you have so many inspirational ideas for me to enjoy. Your new forever home is looking all pretty in it's very first Fall. 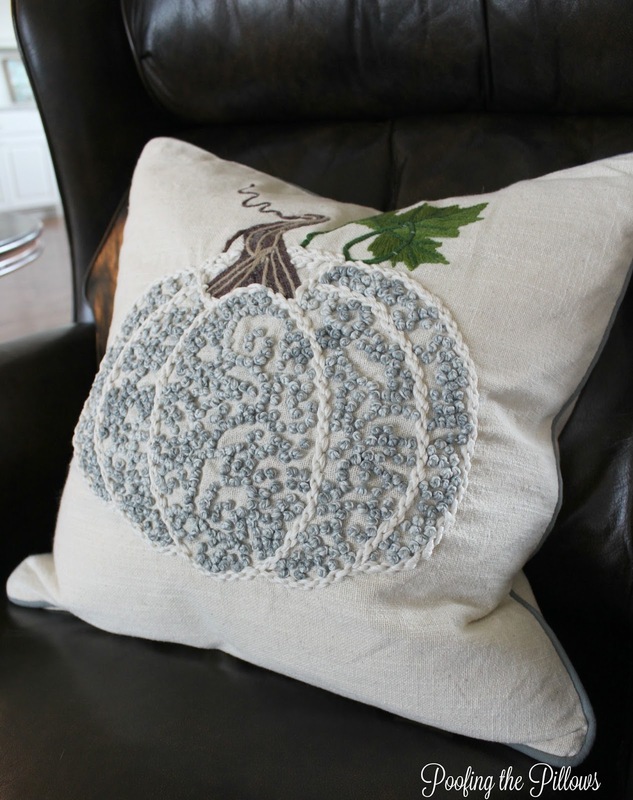 The pumpkin pillow is wonderful, along with all your pops of turquoise color. I still love apothecary jars, too! Thank you for the tour this morning. What a beautiful home you have! I love seeing what you are doing with it! Thanks for the tour! This was lovely Stacey....thank you for sharing your lovely home with us. Happy October! Stacey, I love your new blog design. Looks awesome. 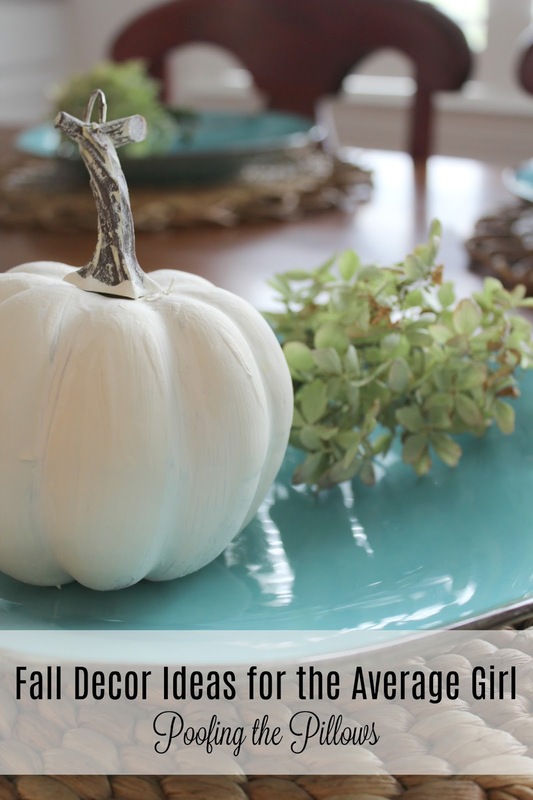 Love those glass pumpkins too and all the simple touches. It just fits you and your home. You always keep things just simple enough to look classic and stylish. And I love Texas...lived there many years and still miss it! Enjoy your day sweet lady! Hugs! I love your plates and the scale. Both are so pretty. I also love the glass pumpkin! Well, I love all colored glass. So pretty. I think that you home looks wonderful. And you are so right, it's hard to get excited about fall when the air conditioner is running non-stop! Great post on so many levels! I always have this vision of myself of having it all together as well...but I have to be realistic too! Calligraphy is also on my list - among a million other things! Your home looks beautiful! 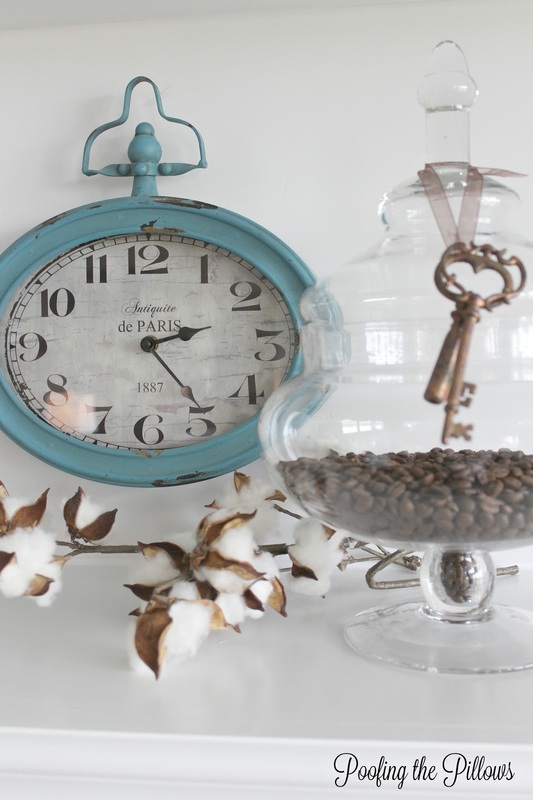 I love the glass pumpkin and the turquoise clock. I have a clock similar to it. It all looks so pretty Stacey. I love that pillow you found at TJ Maxx. Gorgeous find. What a lovely invitation to enjoy so many fall decorating ideas. You have inspired me and thanks so much for sharing you talent! I'm with you! I have those same dreams of looking all cute cutting veggies or holding a big bouquet of flowers about to place them in a vase... I love your average girl fall home tour - your home is warm, inviting and very real. To me, that is priceless. I love it. So simple and easy to live with. Thanks for getting our tour together. Happy fall. This is a lovely tour of your pretty home all dressed for Fall! 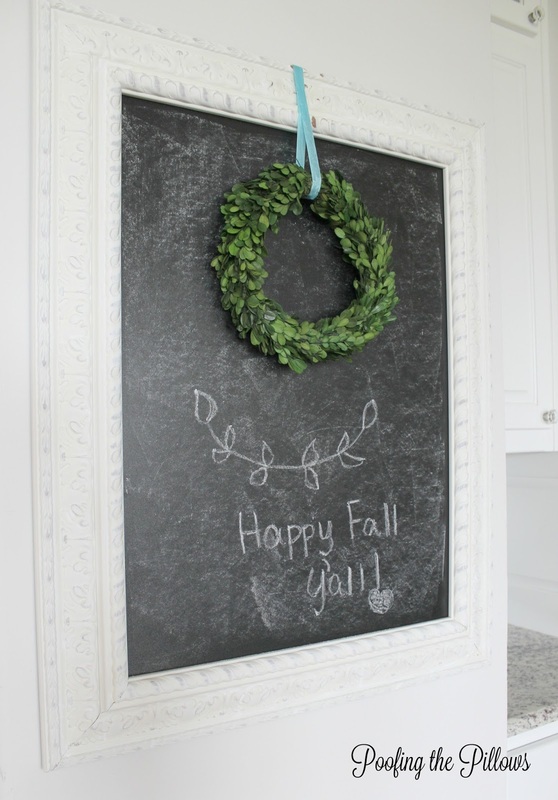 I love the simplicity of your fall decor and especially your color scheme. I'm going to look for some eucalyptus now! Beautiful, Stacey. Thanks for the tour and the inspiration. I love the pretty soft touches you added for fall. You can add me to the Wednesday list. Thanks! First of all, that pillow! It is gorgeous. 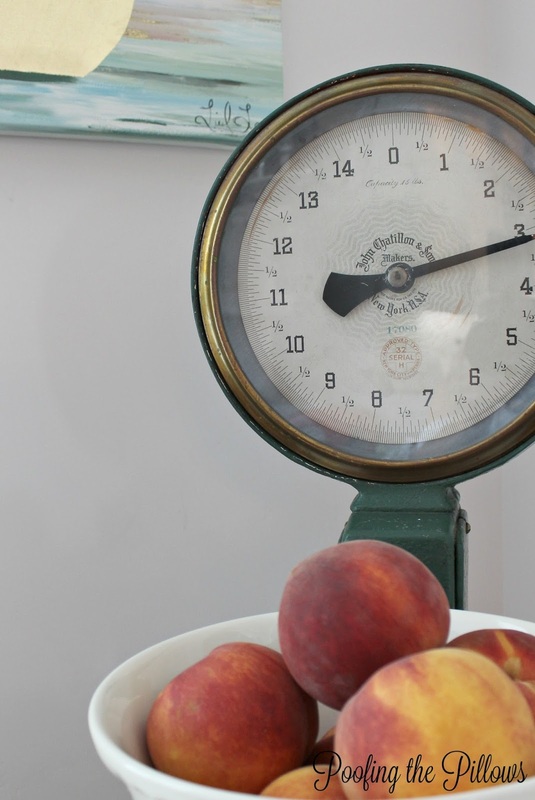 Your peaches are also lovely on your scale. What a gorgeous fall home. Love everything. Fall temperatures have finally arrived for a few days here, and we are loving the cooler air. 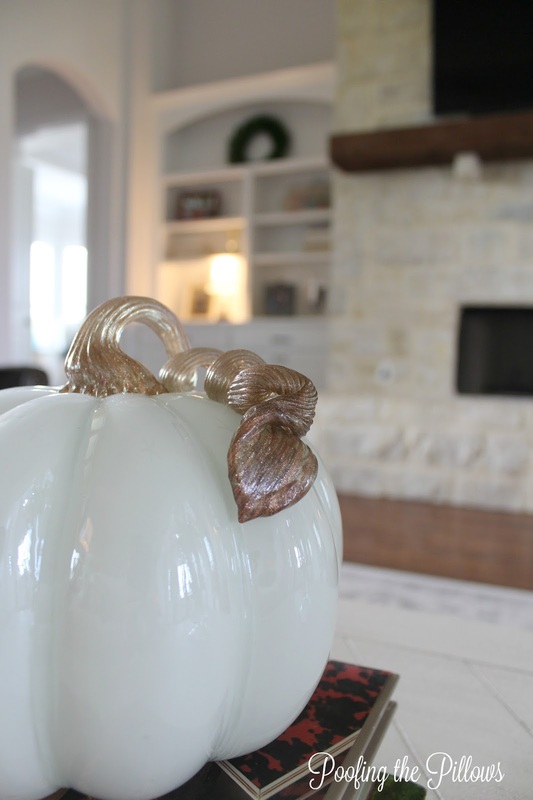 So cozy all dressed up for fall in your new home! Loved your tour..so many pretties here. Stacey, I love the autumn touches you have added...they are perfect! Love the new pumpkin from TJ MAXX, and fresh eucalyptus is wonderful. I would be fine in your beautiful home with just a cup of coffee, no cake needed! I notice lately that you've gotten very good with your camera! Great photos, great words. Totally enjoyed it. And no, you aren't the last one that learns about eucalyptus, that would be me. I wondered where everyone was getting it. Beautiful! I'm not that girl, either! I have a few little fall trinkets popped about and did it when the chill finally blew in. LOVE the hydrangeas on the plates...love. Lots of pretties here and I love the soft look you've created for Fall. It's perfect for your pretty home. I love all of your goodies for fall, Stacey! The pumpkin pillow is so pretty! Such a pretty fall home, I love the new look. I love the new home as well. How long you have been in it. I just sold me home and planning on building again. Oh Stacey, how wonderful your new home is. So beautiful and with so many lovely touches. Love the pumpkins and your lantern and table. And do I recognize those turquoise plates? A happy memory to be sure. So thrilled you have a new canvas on which to display your decorating skills! I just love your decor and your sentiments too. It's always best when we cut ourselves some slack and say goodbye to perfection. I think it makes us relax and also makes others around us feel more comfortable knowing that we're not "perfect." Have a great week! You are the above average girl that is humble and down to earth just like I like people. I like bloggers being more real. If I captured my house on a daily basis it would be entertainment for sure. I love your pillow. Where did you find it? I found one at Pier 1 in those colors but I like yours better. All your fall touches are creative and inspiring. I've fallen in love with Texas since my son moved there three years ago and I have gotten to know a lot of you Texas gals. You are special! Very pretty fall fluffing! And I LOVE your photography. You have skills! 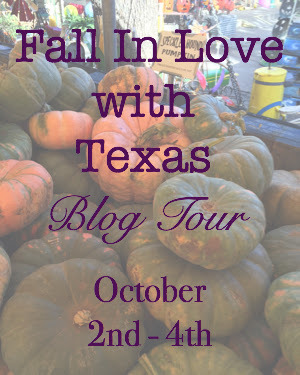 What a great blog hop!...Love Texas...and must say love that blue pumpkin pillow....Yes, just love the Seeded Eucalyptus...so fragrant, beautiful and inexpensive...a great bang for your buck! Beautiful Fall details Stacey! Nothing average there!!! Everything looks lovely, and I have to get out and look for that candle!! You are above average on all counts!! So pretty Stacey! Love all of your fall touches but I especially love your new glass pumpkin. Happy Fall! Stacey, thanks for sharing your beautiful inspiration at Vintage Charm--pinned to our Features & Favorites!